Korean suffers from the same bad reputation Mandarin does. Many regard it as just too difficult to learn. Korean, or Hangugeo, is a rich language steeped in culture, history, and beauty. Although it is on the complex side, it is no more difficult to master than any other language. In fact, the basics of Korean can be honed in as little as three months. So if you are wondering how to learn Korean to speak, all you have to do is approach the language in the right way. Hangeul is the Korean alphabet. It is an excellent place to start when attempting to learn the language. This is because Hangeul is a simple alphabet. Most English learners are thrown by Hanguel because it is nothing like the Roman Alphabet, but once you familiarize yourself with it learning the language is a lot easier. According to history Hangeul came to be at the time of the Joseon Dynasty back in 1443. It has 24 letters, which is two less than standard English. These 24 letters have 14 consonants and 10 vowels. Hanguel also has double consonants and diphthongs. If you include those the alphabet rounds out at 40 letters total. Learning Korean alphabet helps you readily identify symbols and work out the meaning of words on your own. It also helps you better recognize complexities like diphthongs and double consonants. Additionally, honing Hangeul is a shortcut to both reading and writing. If you remember taking Spanish in high school you will probably recall learning numbers early on. This is because learning how to count in another language is important in forming a general understanding of that language. The same can be said for Korean. Numbers are a huge part of basic communication. They also aid learners in better recognizing and deciphering symbols. Numbers are also a shortcut to basic syntax and context. The Korean language utilizes to different sets of cardinal numbers. These two sets are Korean and Sino-Korean. Korean form is used for numbering items and range between 1 and 99. It is also used for numbering age. So you would use Korean form to describe how old you are, how many glasses of water you drink, or the number of cats residing in your home. Sino-Korean is used to number dates, phone-numbers, money, addresses, and any number over 100. A good example of this is the number one. In Korean it looks like this, 하나, and is pronounced “hana”. In Sino-Korean it looks like this, 일, and is pronounced “il”. The fastest way to learn any language is by memorizing basic vocabulary. If you familiarize yourself with simple, everyday words you can build a working dialogue very easily. It is also extremely useful as it allows you to think a about Korean phrases in English. Helpful tricks to garnering such a vocabulary are repetition and association. Repetition – If you expose yourself to information over and over eventually it becomes stuck in your head. You do not want to force this exposure so make it as natural as possible. Memorize a certain number of words a day but do not overstimulate yourself. Overexposure will confuse you and also cause your brain to forget what you’ve learned at a faster rate. Association – If you want to know how to learn Korean to speak simply associate Korean words with your everyday. A good tip is to write words down when you hear them. This allows you to learn words in context. Also, pin notecards with Korean translations on common household items. Think of these items in Korean when you look at them. The more you associate the more your mind thinks of words in both languages. This is how someone can be thinking in English while speaking in Korean and not even realize they are speaking Korean. It is also how someone can hear conversation in Korean and respond in English without hesitation. One of the best answer to, “how can I learn to speak Korean”, is to actually start speaking Korean. The difference between practical application and academic study is substantial. You can learn an entire list of vocabulary words and still be utterly confused in an actual conversation. This is because applying these words in everyday speech requires and understanding of grammar and context. A great way to shortcut this is to learn basic conversational phrases. Polite conversation is easier to learn and apply so memorize basic Korean conversation. An example would be phrases like 안녕, which is pronounced “anyeong”. This is the casual way to say hello. There is also a formal way derived from the same character pronounced “anyeong-haseyo”. One of the first things one learns when studying a language is how to say hello and goodbye. By mastering such rudimentary conversational phrases you create a foundation to help you learn the rest. You not only pick up fundamentals but you also begin to learn complexities as well. Informal is spoken to your peers. Polite is used to address people older than you. Honorific is reserved for news and army addresses. 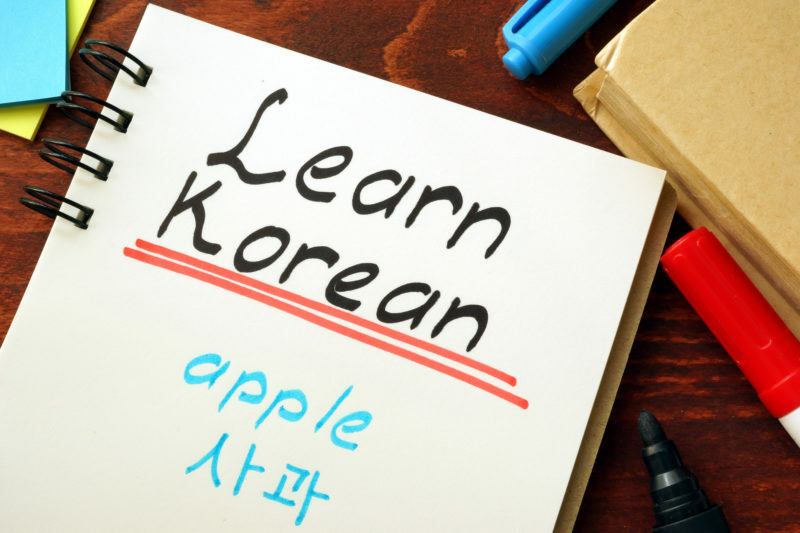 Visiting academic websites, utilizing software programs, or even attending a course are all great ways to learn Korean. Sure, you can go about it on your own but it is never a bad idea to accept help. In today’s world help is readily available everywhere. The internet can bring books, databases, and master classes right in to the comfort of your own home. Seeking professional help also ensure you will learn the right way. Speaking to native speakers is also a great idea. Not only can they help with your pronunciation and basic fundamentals, they also use Korean words in proper context. Talking with someone who is fluent gives you an idea of how the words should be used in proper conversation. After all, who better to know then someone who speaks it as their first language. Another great resource of context is Korean entertainment. Music, T.V. shows, movies, and even ads use Korean language in proper subtext. You can pull an entire list of commonly used words from such a source. Memorizing these words gives everyone a fundamental idea of how conversation looks.